Transfer of naive CD4 T cells into lymphopenic mice initiates a proliferative response of the transferred cells, often referred to as homeostatic proliferation. Careful analysis reveals that some of the transferred cells proliferate rapidly and undergo robust differentiation to memory cells, a process we have designated spontaneous proliferation, and other cells proliferate relatively slowly and show more limited evidence of differentiation. In this study we report that spontaneous proliferation is IL-7 independent, whereas the slow proliferation (referred to as homeostatic proliferation) is IL-7 dependent. Administration of IL-7 induces homeostatic proliferation of naive CD4 T cells even within wild-type recipients. Moreover, the activation/differentiation pattern of the two responses are clearly distinguishable, indicating that different activation mechanisms may be involved. Our results reveal the complexity and heterogeneity of lymphopenia-driven T cell proliferation and suggest that they may have fundamentally distinct roles in the maintenance of CD4 T cell homeostasis. Homeostatic regulation of T lymphocytes is an important process by which the immune system ascertains its diversity and functionality (1, 2). It is now well accepted that the transfer of naive T cells into a lymphocyte-deficient environment initiates proliferative responses (3). The nature of the proliferative responses, however, is somewhat different depending on the type of lymphopenic model. Sublethal irradiation-induced lymphopenia is transient because of endogenous repopulation. The resultant proliferative response is dominated by cells that divide once every 2–4 days, or less. In contrast, the lymphocyte deficiency caused by disruption of genes responsible for lymphocyte generation is severe. In these animals, a very rapid proliferative response dominates, with cells undergoing more than one division per day, although some slow proliferation is also observed (4, 5). We have recently proposed that the rapid proliferation of naive CD4 T cells that occurs upon transfer into RAG−/− recipients is regulated not by the total number of peripheral CD4 T cells, but, rather, by the TCR repertoire complexity of the resident memory cells, presumably through competition for Ags (6). We have suggested that this rapid proliferation be designated spontaneous proliferation (6). IL-7 is a type I cytokine that is critically important in lymphocyte generation (7). It is generally believed that IL-7 plays a key role in lymphopenia-induced T cell proliferation (8, 9). 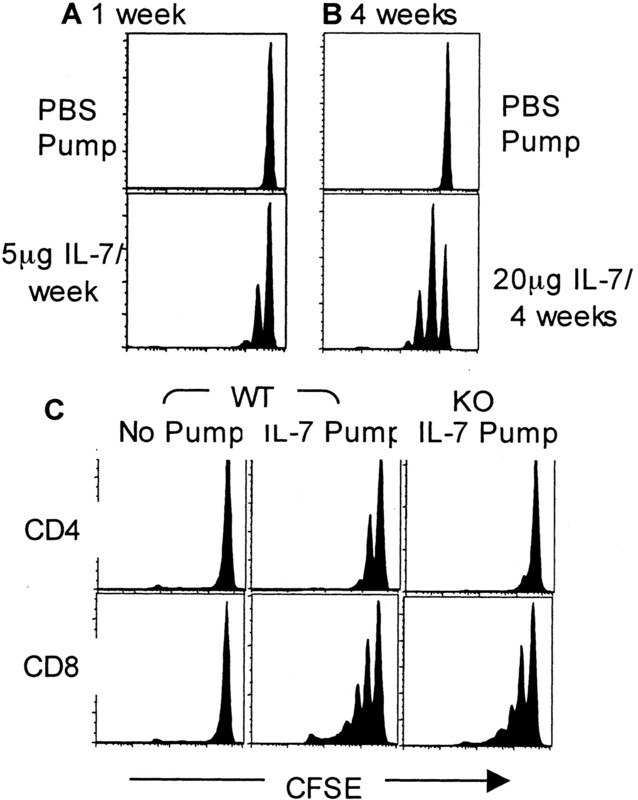 By contrast, Ag-driven T cell proliferation has been reported to be IL-7 independent, and we have observed that the spontaneous proliferation that occurs when CD4 T cells are transferred to 1-day-old mice is IL-7 independent (8, 10). In this study we examine lymphopenia-driven proliferation more carefully and show that rapid and slow proliferation differ in their requirements for IL-7; IL-7 was critical for the slow proliferation, but was not necessary for spontaneous proliferation to occur. Administration of IL-7 induced the slow proliferative response, but not the spontaneous proliferation of transferred naive CD4 T cells (and CD8 T cells) within wild-type recipients. This suggests that the slow proliferation is controlled by competition for IL-7 and that IL-7 controls the homeostatic process represented by this proliferation. Moreover, although both rapid and slow proliferations are associated with acquisition of new properties, the degree to which this occurs is quite different in cells undergoing homeostatic and spontaneous proliferation. Our data thus reveal the complexity and heterogeneity of T cell proliferation within the lymphopenic environment. B10.A, Ly5.1 B10.A, B10.A 5C.C7 TCR Tg RAG2−/−, and B10.A RAG2−/− mice were obtained from the National Institute of Allergy and Infectious Diseases contract facility at Taconic Farms. C57BL/6 mice were purchased from Division of Cancer Treatment, National Cancer Institute. C57BL/6 I-Abβ knockout mice were purchased from Taconic Farms. All mice were maintained under pathogen-free conditions at the National Institute of Allergy and Infectious Diseases animal facility. Naive (CD44dull) CD4 T cells from lymph nodes were prepared by cell sorting using a FACSVantage SE or FACSDiva (BD Biosciences). Purity was usually >98%. Naive CD4 T cells were then labeled with CFSE (Molecular Probes) and transferred into recipient mice i.v. In some experiments, 1 mg of anti-IL-7Rα (A7R34) Ab was injected i.p. every 3 days. Some of the recipients were implanted with a mini-osmotic pump (Alzet) containing 5 μg of murine IL-7 (PeproTech). The proliferation rate was assessed by administration of BrdU for 6 h and measurement of incorporation as previously described (6). Lymph node cell suspensions were prepared at the indicated times after transfer and analyzed for the proliferation profile of transferred cells. The following Abs were purchased from BD Pharmingen: biotinylated anti-Ly5.1 (A20), CyChrome-anti-CD44 (IM7), allophycocyanin-anti-CD4 (RM4-5), streptavidin-PE, PE-anti-CD69 (H1.2F3), PE-anti-CD44 (IM7), PE-anti-CD25 (PC61), PE-anti-CD62L (MEL-14), PE-anti-IL-2 (JES6-5H4), and PE-anti-IFN-γ (XMG1.2). Biotinylated anti-CD127 (A7R34) was purchased from eBioscience. Flow cytometry was performed on FACSCalibur (BD Biosciences), and data were analyzed with CellQuest or FlowJo software (Treestar). BrdU detection was previously described (6). In some experiments cells were ex vivo stimulated with PMA (10 ng/ml) plus ionomycin (1 μM) for 4 h. Monensin was added during the last 2 h of stimulation. Subsequently, cells were fixed, permeabilized, and stained for IL-2 and IFN-γ. Some 50,000–200,000 events were acquired and analyzed for each flow analysis. We have previously proposed that spontaneous proliferation is a mechanism by which naive CD4 T cells differentiate into a memory population of great diversity in the absence of intentionally administered exogenous Ags (6). In the course of these experiments we noted that two distinct types of proliferative responses occurred upon transfer of naive CD4 T cells into RAG2−/− mice (Fig. 1⇓A). In addition to a cell population that underwent spontaneous proliferation, marked by complete dilution of CFSE within a 7-day period and acquisition of a series of memory properties, another population of proliferating cells was observed. These cells divided only once or twice during the week after transfer, which is similar to the conventional homeostatic proliferation observed in the irradiated lymphopenic environment (Fig. 1⇓C) (9). When TCR transgenic RAG2−/− mice were used as recipients, the slowly proliferating cells were not observed; only the spontaneous proliferation occurred (Fig. 1⇓B). Slow proliferation also failed to occur in a series of other TCR transgenic mice, as we and others have previously reported (6, 11), suggesting that inhibition of slow proliferation was mediated by the presence of endogenous transgenic T cells, even though these cells fail to inhibit spontaneous proliferation (6). In sublethally irradiated recipients, slowly proliferating cells (homeostatic proliferation) were dominant, but a population that had undergone spontaneous proliferation was clearly visible (Fig. 1⇓C) (9). When naive CD8 T cells were transferred, they showed slow proliferation in RAG2−/− recipients, but not in transgenic OT-I RAG2−/− recipients (Fig. 1⇓, D and E), similar to the behavior of CD4 T cells upon transfer to RAG2−/− and transgenic RAG2−/− recipients. These results suggest that spontaneous and homeostatic proliferations are fundamentally distinct responses that are regulated by different mechanisms. Proliferative responses of naive T cells upon transfer into different lymphopenic hosts. Naive (CD44dull) Ly5.1 CD4 or CD8 T cells (2 × 106) were CFSE labeled and transferred into RAG2−/− (A and D), 5C.C7 TCR Tg RAG2−/− (B), sublethally irradiated (600 cGy; C), and OT-I TCR Tg RAG−/− (E) mice. CFSE profiles of transferred cells (Ly5.1+ CD4+) were analyzed 7–14 days after transfer. Experiments were repeated more than twice with similar results (more than three individual mice were used for the experiments). Next we examined the role of IL-7 in the spontaneous and homeostatic proliferative responses. To this end, CFSE-labeled naive CD4 T cells were transferred into RAG2−/− mice that received anti-IL-7Rα. As shown in Fig. 2⇓A, anti-IL-7Rα administration completely abolished the slow homeostatic proliferative responses. A significant decrease in recovery of cells that divided zero to two times was observed in the anti-IL-7Rα-treated animals. By contrast, spontaneous proliferation was not affected by Ab treatment, as determined by CFSE dilution, cell recovery, or BrdU uptake (Fig. 2⇓A). IL-7-independent spontaneous proliferation and IL-7-dependent homeostatic proliferation. A, CFSE-labeled naive (CD44dull) Ly5.1 CD4 T cells (2 × 106) were transferred into RAG2−/− mice. The recipients were injected i.p. with either 1 mg of anti-IL7Rα mAb (A7R34) or control rat IgG every 3 days, and lymph node cells were harvested 7 days after transfer. CFSE profiles and BrdU uptake (determined by 6-h BrdU pulse) of transferred cells were measured, as were total CD4 T cell recoveries of lymph node cells that had undergone zero to two and more than seven divisions. 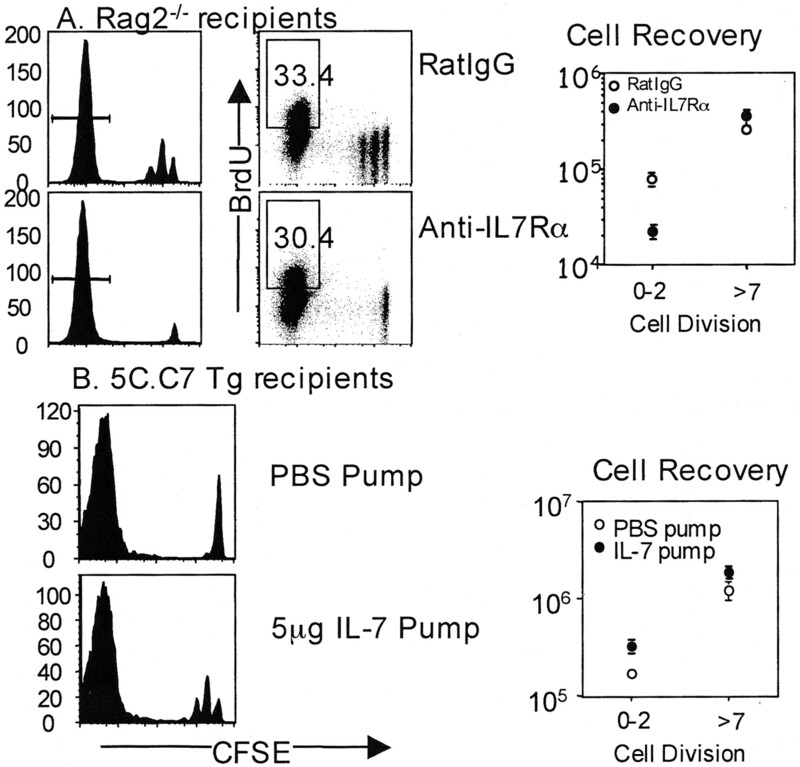 B, CFSE-labeled naive CD4 T cells were transferred to 5C.C7 TCR Tg RAG2−/− mice. On the same day, recipient mice were implanted with a miniosmotic pump containing either PBS or 5 μg of murine IL-7. Shown are CFSE profiles and cell recoveries of transferred cells (Ly5.1+CD4+) 7 days after cell transfer. All experiments (two to four individual mice per experiment) were repeated more than twice with similar results. If homeostatic proliferation is dependent on the presence of IL-7, then its failure to occur in transgenic RAG2−/− recipients might be ascribed to limited availability of IL-7 because of its consumption by the resident transgenic T cells. Indeed, providing additional rIL-7 using a miniosmotic pump induced slow homeostatic proliferation within 5C.C7 TCR Tg mice that had received naive CD4 T cells (Fig. 2⇑B). 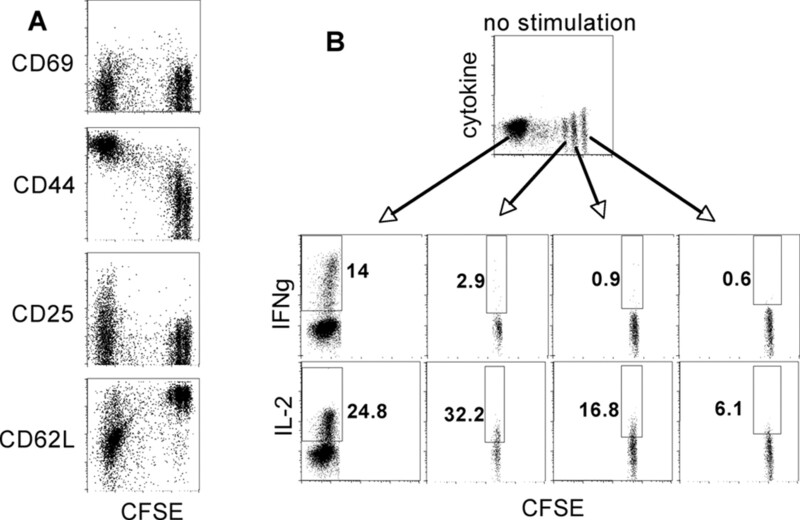 IL-7 did not affect spontaneous proliferation measured by CFSE dilution (Fig. 2⇑B) or BrdU uptake (data not shown). These results indicate that spontaneous proliferation induced by severe lymphopenia is driven by an IL-7-independent mechanism, as observed in neonatal recipients (6, 10), whereas slow homeostatic proliferation appears to be dependent on the concentration of IL-7 in the microenvironment. Because it was previously observed that some transferred T cells could still undergo rapid proliferation in irradiated, IL-7-deficient mice (9), it is unlikely that residual IL-7 signaling, even in the face of neutralizing anti-IL-7Rα Ab, could be required for spontaneous proliferation. Alpdogan et al. (12) have recently reported similar types of fast and slow responses in a lymphopenic allogeneic transfer model and observed differential degrees of IL-7Rα down-regulation on those cells. Alloreactive, fast-dividing cells significantly down-regulated IL-7Rα, whereas the expression of IL-7Rα expression was not altered on nonalloreactive, slowly (homeostatically) dividing cells. Because activated effector T cells have also been shown to down-regulate IL-7Rα expression (8), we measured IL-7Rα expression on cells that had undergone spontaneous and homeostatic responses. We did not observe a significant down-regulation of IL-7Rα on fast (spontaneously)-proliferating cells, as has been reported for alloreactive fast-dividing cells (Fig. 3⇓), suggesting that the spontaneous proliferation in lymphopenic environment differs in an important manner from those alloresponses observed by Alpdogan et al. (12). IL-7Rα expression during spontaneous and homeostatic proliferation. FACS-sorted Ly5.1 naive CD4 T cells were CFSE labeled and transferred into RAG2−/− mice (3 million cells/mouse). Lymph node cells were harvested 7 days after transfer, and IL-7Rα expression was measured by FACS analysis. Experiments were repeated twice with similar results. Because our results suggest that the local concentration of IL-7 is an important factor for homeostatic proliferation of CD4 T cells and because transgenic overexpression of IL-7 in mice has been shown to lead to a significant increase in peripheral T cell number (13), we asked whether providing additional IL-7 would induce homeostatic proliferation of naive CD4 T cells in a lymphocyte-sufficient environment. Administration of 5 μg of IL-7 in a miniosmotic pump for 1 wk caused a >2-fold increase in lymphoid organ cellularity in normal mice (data not shown). The proportions of CD4 and CD8 T cells from those mice were similar to those in controls receiving a PBS pump, indicating that the IL-7-mediated increase in cellularity is a general effect (data not shown). CFSE-labeled naive CD4 T cells were transferred into wild-type syngeneic recipients, and miniosmotic pumps containing 5 μg of IL-7 were implanted. As shown in Fig. 4⇓A, a portion of transferred naive CD4 T cells went through one or two cell divisions in animals that received IL-7 pumps, whereas PBS pumps did not cause any cell division. If IL-7 administration was extended for 4 wk, the population continued the process of slow division; a more significant portion of transferred naive CD4 T cells had undergone one or two cell divisions (Fig. 4⇓B). In contrast, implanting a PBS pump failed to induce any cell division even after 28 days (Fig. 4⇓B). We did not observe any appreciable population among the transferred cells that had divided rapidly in response to IL-7, further supporting the idea that IL-7 plays little or no role in spontaneous proliferation. Nevertheless, IL-7-induced homeostatic proliferation appeared to require an interaction between TCR and MHC/self-Ag complexes. As shown in Fig. 4⇓C, IL-7-induced homeostatic proliferation was largely abolished in I-Abβ-deficient recipient mice, whereas cotransferred CD8 T cells still proliferated in the presence of IL-7 (Fig. 4⇓C). These results demonstrate that an increasing IL-7 concentration induces homeostatic proliferation even within lymphocyte-sufficient, wild-type recipients in a TCR-MHC-dependent manner. Spontaneous proliferation of CD4 T cells has previously been shown to be MHC class II dependent (6, 10). IL-7-driven homeostatic proliferation in lymphocyte-sufficient mice. A and B, CFSE-labeled naive Ly5.1 CD4 T cells (2–4 × 106) were transferred into wild-type mice. Recipient mice were simultaneously implanted with a miniosmotic pump containing either PBS or 5 μg of IL-7. Lymph node cells were harvested 7 days (A) or 28 days (B) after transfer, and CFSE profiles of transferred cells (Ly5.1+CD4+) were determined by FACS analysis. C, CFSE-labeled naive T cells (CD4 and CD8; 4 × 106) were transferred into either wild-type or I-Abβb knockout mice. Miniosmotic pumps containing 5 μg of IL-7 were simultaneously implanted as described above. Lymph node cells were collected 7 days after transfer, and CFSE profiles were determined by FACS analysis. Similar results were obtained from more than two independent experiments (two to four individual mice were tested per experiment). Rapid proliferation in lymphopenic environments is generally associated with a process of differentiation through which cells of memory phenotype are generated (14, 15, 16). We have shown that cells undergoing spontaneous proliferation up-regulate CD44, acquire the capacity to produce IFN-γ, and preferentially home to the liver (6). To further analyze the phenotypes of proliferating cells, naive CD4 T cells were transferred into RAG2−/− mice, so that both spontaneous and homeostatic proliferation could be compared within same recipients. As shown in Fig. 5⇓A, CD44 expression was greatest on cells undergoing spontaneous proliferation, but a correlation between slow division and CD44 up-regulation was also observed on the cells undergoing homeostatic proliferation. Interestingly, relatively few CD25+ cells were found among cells undergoing spontaneous proliferation, and there was no up-regulation of CD25 during homeostatic proliferation. The CD25+ cells among the spontaneously proliferating population may reflect recently described regulatory T cells that are generated in a lymphopenic environment (17). CD62L expression was down-regulated on most spontaneously proliferating cells; in contrast, very few homeostatically cells showed diminished expression of CD62L. Up-regulation of CD69 was not observed in either cell population. When cells were stimulated with PMA plus ionomycin to measure cytokine-producing capacity, the proportion of homeostatically proliferating cells capable of producing IL-2 increased with cell division; there were 6% IL-2-producing cells among zero-division cells, 17% among one-division cells, and 32% among two-division cells compared with 24.8% among spontaneously proliferating cells (Fig. 5⇓B). Unlike cells that had undergone spontaneous proliferation, among which 15–40% produced high levels of IFN-γ upon stimulation, only 1–3% of homeostatically proliferating cells produced IFN-γ, suggesting that these cells might be still uncommitted CD4 T cells producing mostly IL-2 (18). Therefore, cells undergoing spontaneous proliferation acquire an activated/memory phenotype that differs from cognate Ag-stimulated T cells in the expression of some activation markers, such as CD69 and CD25, and IL-7Rα, whereas IL-7-driven homeostatic proliferation is associated with a degree of differentiation marked by modest induction of CD44 and acquisition of increased capacity to produce IL-2. Differentiation associated with IL-7-induced homeostatic proliferation. A, Naive Ly5.1 CD4 T cells were CFSE labeled and transferred into RAG2−/− mice (two or three mice per group). Recipient mice were killed 1 wk after transfer, and the expression of activation markers was measured. CFSElow cells represent spontaneous proliferation, whereas one- to two-division cells represent IL-7-dependent homeostatic proliferation. Β, 5C.C7 transgenic mice that received both Ly5.1 naive CD4 T cells and a miniosmotic pump containing 5 μg of IL-7 were killed 7 days after transfer. Cells that had divided zero, one, two, and more than seven times were purified by cell sorting, stimulated with PMA (10 ng/ml) plus ionomycin (1 μM), and stained for cytosolic contents of IL-2 and IFN-γ. The frequencies of IL-2- and IFN-γ-producing cells are shown. Similar results were obtained from two independent experiments. Our results reveal that two fundamentally distinct proliferative responses occur when naive CD4 T cells are introduced into a lymphopenic environment. As we have previously shown, spontaneous proliferation is a process marked by multiple divisions in a relatively short period (rapid proliferation), associated with acquisition of a memory cell phenotype, in which the repertoire complexity of pre-existing memory cells plays a critical role in regulating the frequency of cells that proliferate. Anti-IL-7Rα Ab failed to block the rapid proliferation observed when naive CD4 T cells were transferred into neonatal mice (6). In this study we have shown that anti-IL-7Rα fails to diminish the proportion of CD4 T cells transferred into a RAG2−/− host that fully dilutes their CFSE, nor does it change the proliferative rates of these cells, as measured by short term in vivo BrdU labeling. In contrast, homeostatic proliferation of CD4 T cells is marked by relatively slow division rates, and the proportion of cells that had divided once or twice that takes up BrdU in response to short term labeling is very low. Naive CD4 T cells, even of a single specificity, could block this response, suggesting that it represents competition for some limiting, nonspecific stimulant. Anti-IL-7Rα has been reported to inhibit slow proliferation of wild-type cells transferred to lymphopenic recipients (5). In this study we show that administration of exogenous IL-7 by a miniosmotic pump induced slow (homeostatic) proliferation among naive CD4 T cells even in normal, lymphocyte-sufficient recipients, suggesting that the local concentration of IL-7 is important for such a response to occur. In the literature, all T cell proliferation in lymphopenic environments has often been regarded as representing homeostatic proliferation. The possibility of two fundamentally different processes, both induced in lymphopenic settings, has not been extensively considered. Our results provide strong evidence for the existence of two distinct processes and show that the spontaneous proliferation that occurs when CD4 T cells are introduced into RAG2−/− recipients or normal neonates is independent of IL-7 (10). It was recently reported that neutralizing IL-7 diminished the proportion of CD8 T cells that underwent rapid proliferation upon transfer into neonatal mice (19). In contrast, careful analysis of published data reveals that polyclonal CD8 T cells that undergo rapid proliferation in irradiated adult mice are not affected by the lack of IL-7 (9). The slow proliferation of these cells is completely inhibited in the absence of IL-7. Thus, CD8 cells undergoing slow proliferation require IL-7, and in that regard, CD4 cells are similar, as previously reported (9). There is controversy regarding the IL-7 dependence of the rapid proliferation of CD8 T cells; it is possible that this could be explained by differences in the neonatal and irradiated adult environments, although we think that is unlikely. It should be pointed out that CD8 T cells responding to exogenous Ags do not require IL-7 (8). Cells that had failed to undergo spontaneous proliferation may participate in homeostatic proliferation when adequate amounts of IL-7 are available. Because these slow proliferative responses are not seen when cells are transferred in TCR transgenic mice, it seems likely that the resident transgenic cells efficiently compete for IL-7, resulting in a local concentration of IL-7 substantially lower than that in RAG2−/− mice. 5C.C7 transgenic T cells undergo very slow proliferation upon transfer into RAG2−/− mice; that response is completely abrogated by anti-IL7Rα treatment. Such limited responses are not observed when 5C.C7 cells are transferred into 5C.C7 transgenic recipients (data not shown). This observation further supports the idea of IL-7 as a determining factor of homeostatic proliferation in RAG2−/− recipients. Indeed, it has been shown that the IL-7 level is correlated with the extent of lymphopenia (20, 21, 22). Recently, it has been suggested that the level of expression of the IL-7R α-chain varies depending on the recent receipt of a survival signal and may play a critical role in determining the availability of IL-7 for maintaining numbers of naive CD4 and CD8 T cells (23). Alpdogan et al. (12) have reported similar forms of T cell proliferative responses in allogeneic bone marrow transplantation system. Both fast and slow proliferative responses were found upon transfer into lethally irradiated allogeneic recipients, whereas only slow, homeostatic proliferation was observed in the case of transfer into irradiated syngeneic recipients. Fast responses in this study were dependent upon recognition of alloantigens, and most of the responding cells had up-regulated CD25 expression. IL-7Rα expression was significantly down-regulated on the alloreactive T cells, which is consistent with previous reports that showed down-regulation of IL-7Rα after cognate Ag stimulation (8, 24). Surprisingly, cells rapidly proliferating in lymphopenic environments did not down-regulate their expression of IL-7Rα even though they did not require IL-7 for this proliferative response. This suggests that there are important differences between spontaneous proliferation and conventional Ag- or alloantigen-driven proliferation; these differences could reflect differential strengths of signaling. It could be argued that although the rapidly proliferating cells in lymphopenic settings do not down-regulate IL-7Rα, they resemble both the rapidly dividing Ag-responsive and alloresponsive cells dividing rapidly. They primarily use another growth-promoting agent to mediate their proliferation, so that neutralizing IL-7Rα/IL-7 does not diminish their growth rates even though they express numbers of IL-7Rα molecules similar to those found on slowly dividing cells. What determines whether T cells undergo spontaneous or homeostatic proliferation? As noted above, spontaneous proliferation is regulated not by the absolute number of CD44bright CD4 T cells, but, rather, by the repertoire complexity of these cells. Among CD8 (25, 26) and CD4 (25) TCR transgenic cells, those with higher levels of CD5 tend to proliferate rapidly when transferred to lymphopenic recipients. It has been proposed that CD5 may be induced in T cells participating in high affinity interactions, as a feedback control to dampen the degree of activation (27). Therefore, it is logical to speculate that cells with higher affinity for available peptide/MHC might proliferate spontaneously to become memory cells, whereas those with intermediate or low affinity for available ligands would be limited to homeostatic proliferative responses. We have observed that CD4 T cells from 5C.C7 TCR Tg mice express low levels of surface CD5. They fail to undergo rapid, IL-7-independent proliferation and undergo only minimal, IL-7-dependent homeostatic proliferation upon transfer into RAG2−/− mice. By contrast, transgenic cells expressing relatively high levels of CD5, such as CD4 transgenic cells from AND mice and CD8 transgenic cells from OT-I mice, show rapid proliferation (25, 26). These results are consistent with the concept that TCR affinity for available ligands controls proliferative behavior in lymphopenic settings and the presence of pre-existing memory cells with a similar or cross-reactive specificity efficiently inhibits proliferation of newly transferred naive cells potentially capable of such responses (6, 11, 28, 29). The nature of the peptides recognized by cells undergoing spontaneous and homeostatic proliferation has still not been unequivocally established. However, we have observed that the degree of repertoire complexity of CD44bright CD4 T cells from 7-day-old gnotobiotic mice is similar to that from conventional mice of the same strain and that treatment of RAG2−/− mice with a combination of antibiotics for 1 mo does not prevent transferred cells from undergoing spontaneous proliferation (B. Min, G. Foucras, and W. E. Paul, unpublished observations). Thus, it seems unlikely that commensal microorganisms could be the sole source of peptides that drive spontaneous or homeostatic proliferation, although such peptides could still be important in the creation of ligands that the responding T cells recognize. From the current study, however, it is not clear whether, in addition to competition for IL-7, Ag-specific competition is operative among cells undergoing homeostatic proliferation. It will be important to test whether the specificity-determined competition found in spontaneous proliferation also operates during IL-7-driven homeostatic proliferation. It is also interesting to note that IL-7 administration induces homeostatic proliferation of transferred naive CD4 T cells (as well as naive CD8 T cells) in nonlymphopenic immunocompetent recipient mice. Indeed, it has been shown that mice overexpressing IL-7 transgenically or that have received recombinant human IL-7 have increased total numbers of peripheral lymphocytes (13). Komschlies et al. (30) have reported that the administration of human IL-7 increased T cell numbers in the absence of overt T cell activation. Interestingly, they observed an altered CD4:CD8 ratio among IL-7 recipients. It is possible that the high dose of IL-7 (twice daily injections of 10 μg for 7 days) that they used may have caused such an alteration. More recently, Chu et al. (31) demonstrated that exogenous murine IL-7 caused preferential accumulation of naive cells in lymphoid tissue, associated with little or no diminution in the frequency of TCR excision circles, suggesting that an increase in recent thymic emigrants accounted for increased cellularity or that naive cell survival had been extended. In the current study we found that administering relatively small amounts of IL-7 (a total of 5 μg over a 7-day period) significantly increased lymphoid cellularity. Using CFSE-labeled transferred cells, we showed that naive CD4 T cells proliferated only in the presence of exogenous IL-7. Although the determination of which cells divide in this setting may be stochastic, it could reflect differences in TCR affinity for resident peptide/MHC complexes, with the higher affinity cells being more likely to undergo even homeostatic proliferation. Indeed, MHC class II−/− mice do not support homeostatic proliferation (32), and naive 5C.C7 cells appear to undergo much slower proliferation than polyclonal naive cells. Naive T cells undergoing IL-7-driven homeostatic proliferation also show changes in marker expression and cytokine-producing capacity, although they differ from cells undergoing spontaneous proliferation. In mice that received IL-7 for 1–2 wk, those cells that divided twice expressed, on the average, more CD44 than cells that divided once or those that failed to divide, and a substantially greater proportion of those cells produced IL-2 upon challenge than cells that divided once. In turn, the cells that divided once were more likely to produce IL-2 than the cells that failed to divide. In contrast, whether this represents full differentiation to an effector or memory phenotype is not clear. This is in contrast to the cells that undergo spontaneous proliferation, which become CD44bright and retain that heightened expression for a long period (6). Many of these cells also acquire the capacity to produce IFN-γ, whereas few, if any, of the slow-dividing cells, even those that have divided twice, acquired IFN-γ-producing capacity. Similarly, the cells that divide many times acquire the capacity to migrate to the liver, a property also associated with a memory phenotype; among the slowly dividing cells, those that divide twice had no advantage in liver homing over those that have not divided (data not shown). It has been shown that some cells that have been transiently activated in response to their cognate Ag but have failed to polarize retain the capacity to subsequently polarize (18). They may represent cells similar to the homeostatically slow-dividing cells. Alternatively, these slow-dividing cells may represent the existence of a physiologic heterogeneity among naive CD4 T cells. Finally, it is curious to note that those cells undergoing spontaneous proliferation are always observed as a CFSE-diluted population that had divided more than seven times when the recipient mice were killed 7 days after transfer. We have measured the CFSE profile at earlier times after transfer, but failed to find those cells that had undergone two to six cell divisions during spontaneous proliferation (our unpublished observations). It is possible that this is due to their prolonged interaction with dendritic cells within lymphopenic hosts and the consequent difficulty of obtaining these cells in a single-cell suspension. We are currently investigating this issue. Overall, our results revealed a complexity of lymphopenia-driven T cell proliferation and lymphocyte homeostasis. Additional studies, focusing on the underlying regulatory mechanisms of peripheral homeostasis, may clarify the physiologic mechanisms of these processes and help to develop strategies to overcome the autoimmune diseases often observed when homeostasis is dysregulated. We thank Sarah Tanksley and Carol Henry for excellent cell sorting. Stockinger, B., T. Barthlott, G. Kassiotis. 2004. The concept of space and competition in immune regulation. Immunology 111: 241-247. Dummer, W., B. Ernst, E. LeRoy, D.-S. Lee, C. D. Surh. 2001. Autologous regulation of naive T cell homeostasis within the T cell compartment. J. Immunol. 166: 2460-2468. Seddon, B., R. Zamoyska. 2002. TCR and IL-7 receptor signals can operate independently or synergize to promote lymphopenia-induced expansion of naïve T cells. J. Immunol. 169: 3752-3759. Min, B., G. Foucras, M. Meier-Schellersheim, W. E. Paul. 2004. Spontaneous proliferation, a response of naïve CD4 T cells determined by the diversity of the memory cell repertoire. Proc. Natl. Acad. Sci. USA 101: 3874-3879. Schluns, K. S., W. C. Kieper, S. C. Jameson, L. Lefrancois. 2000. Interleukin-7 mediates the homeostasis of naïve and memory CD8 T cells in vivo. Nat. Immunol. 1: 426-432. Tan, J. T., E. Dudl, E. LeRoy, R. Murray, J. Sprent, K. I. Weinberg, C. D. Surh. 2001. IL-7 is critical for homeostatic proliferation and survival of naïve T cells. Proc. Natl. Acad. Sci. USA 98: 8732-8737. Min, B., R. McHugh, G. D. Sempowski, C. Mackall, G. Foucras, W. E. Paul. 2003. Neonates support lymphopenia-induced proliferation. Immunity 18: 131-140. Alpdogan, O., S. J. Muriglan, J. M. Eng, L. M. Willis, A. S. Greenberg, B. J. Kappel, M. R. M. van den Brink. 2003. IL-7 enhances peripheral T cell reconstitution after allogeneic hematopoietic stem cell transplantation. J. Clin. Invest. 112: 1095-1107. Mertsching, E., C. Burdet, R. Ceredig. 1995. IL-7 transgenic mice: analysis of the role of IL-7 in the differentiation of thymocytes in vivo and in vitro. Int. Immunol. 7: 401-414. Cho, B. K., V. P. Rao, Q. Ge, H. N. Eisen, J. Chen. 2000. Homeostasis-stimulated proliferation drives naïve T cells to differentiate directly into memory T cells. J. Exp. Med. 192: 549-556. Murali-Krishna, K., R. Ahmed. 2000. Naive T cells masquerading as memory T cells. J. Immunol. 165: 1733-1737. Wang, J., T. Mosmann. 2001. In vivo priming of CD4 T cells that produce interleukin (IL)-2 but not IL-4 or interferon (IFN)-γ, and can subsequently differentiate into IL-4- or IFN-γ-secreting cells. J. Exp. Med. 194: 1069-1080. Schuler, T., G. J. Hammerling, B. Arnold. 2004. Cutting edge: IL-7-dependent homeostatic proliferation of CD8+ T cells in neonatal mice allows the generation of long-lived natural memory T cells. J. Immunol. 172: 15-19. Napolitano, L. A., R. M. Grant, S. G. Deeks, D. Schmidt, S. C. De Rosa, L. A. Herzenberg, B. G. Herndier, J. Andersson, J. M. McCune. 2001. Increased production of IL-7 accompanies HIV-1-mediated T-cell depletion: implications for T-cell homeostasis. Nat. Med. 7: 73-79. Isgro, A., F. Aiuti, I. Mezzaroma, F. Franchi, A. M. Mazzone, F. Lebba, A. Aiuti. 2002. Interleukin 7 production by bone marrow-derived stromal cells in HIV-1-infected patients during highly active antiretroviral therapy. AIDS 16: 2231-2232. Bolotin, E., G. Annett, R. Parkman, K. Weinberg. 1999. Serum levels of IL-7 in bone marrow transplant recipients: relationship to clinical characteristics and lymphocyte count. Bone Marrow Transplant. 23: 783-788. Park, J-H., Q. Yu, B. Erman, J. S. Appelbaum, D. Montoya-Durango, H. Leighton Grimes, A. Singer. 2004. Suppression of IL7Ra transcription by IL-7 and other prosurvival cytokines: a novel mechanism for maximizing IL-7-dependent T cell survival. Immunity 21: 289-302. Kassiotis, G., R. Zamoyska, B. Stockinger. 2003. Involvement of avidity for major histocompatibility complex in homeostasis of naïve and memory T cells. J. Exp. Med. 197: 1007-1016. Wong, P., G. M. Barton, K. A. Forbush, A. Y. Rudensky. 2001. Dynamic tuning of T cell reactivity by self-peptide-major histocompatibility complex ligands. J. Exp. Med. 193: 1179-1187. Ge, Q., A. Bai, B. Jones, H. N. Eisen, J. Chen. 2004. Competition for self-peptide-MHC complexes and cytokines between naive and memory CD8+ T cells expressing the same or different T cell receptors. Proc. Natl. Acad. Sci. USA 101: 3041-3046. Geiselhart, L. A., C. A. Humphries, T. A. Gregorio, S. Mou, J. Subleski, K. L. Komschlies. 2001. IL-7 administration alters the CD4:CD8 ratio, increases T cell numbers, and increases T cell function in the absence of activation. J. Immunol. 166: 3019-3027. Chu, Y-W., S. A. Memon, S. O. Sharrow, F. T. Hakim, M. Eckhaus, P. J. Lucas, R. E. Gress. 2004. Exogenous IL-7 increases recent thymic emigrants in peripheral lymphoid tissue without enhanced thymic function. Blood 104: 1110-1119. Tan, J. T., B. Ernst, W. C. Kieper, E. LeRoy, J. Sprent, C. D. Surh. 2002. Interleukin (IL)-15 and IL-7 jointly regulate homeostatic proliferation of memory phenotype CD8+ cells but are not required for memory phenotype CD4+ cells. J. Exp. Med. 195: 1523-1532.